A Spool of Blue Thread by Anne Tyler is next up on our 100 Bestsellers List reading challenge. This novel is categorized as Literary Fiction and was nominated for the Booker Prize. A Spool of Blue Thread is the latest novel (and possibly the last, according to a recent interview) by Pulitzer Prize-winning author Anne Tyler. In looking over the list of twenty books she has written, I was surprised to discover that I had not read any of them. How is that possible, since all of the titles sound so familiar? Literary fiction is not my usual reading choice, though, so that likely explains it. And I’ve never been one to pick up a book just because it’s popular or on the bestseller shelf. 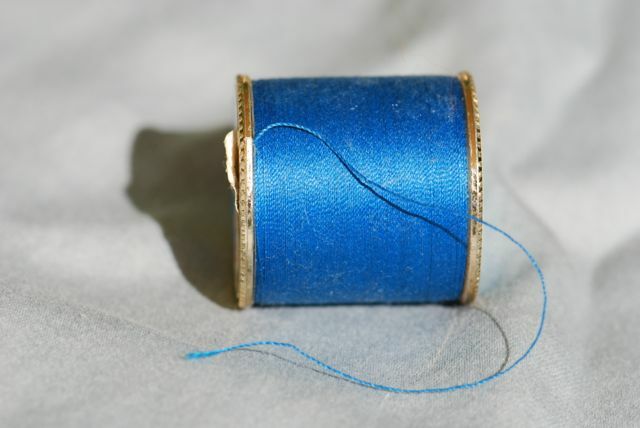 A Spool of Blue Thread, therefore, is my introduction to Anne Tyler and her character-driven novels. Tyler does a nice job of fleshing out her characters, revealing both strengths and foibles through their interactions with family members. As in many families, birth order determines the characters’ actions and family dynamics. The opening chapter is devoted to Denny, the youngest child until the family quasi-adopts the younger Stem. Denny’s prickly demeanor, his obstinacy and anger, and the way he distances himself from the family, sometimes disappearing for years at a time with no contact, create issues for the family throughout the book. His storyline is the nearest thing to an actual plot and resolution that I could find. As Roberta states in her Writer’s Analysis, the Whitshank family has two stories that they tell and retell. The family tells these stories with pride, as they show that family members acquired things (or people) they wanted by working patiently to those ends. But the stories also reveal that these things were acquired through stealth and possible chicanery, and maybe even some amount of lying and backstabbing on the part of Merritt concerning her best friend’s fiance. One story that is not part of the family lore is how Linnie Mae and Junior met and eventually married. At the beginning of the chapter that reveals their relationship, it appears that Junior holds all the power and Linnie Mae is his under-aged victim, but by the end of the chapter it is obvious that Linnie Mae is just as intentional and devious as Junior. Eventually Junior realizes that he’s been the unwitting “victim” of Linnie Mae’s designs to leave her hometown and get married and that Linnie Mae is not the gullible and naive young girl she seemed to be. I enjoyed this back story of Junior and Linnie Mae as it revealed the quiet power that the matriarch of the Whitshanks had and showed that daughter Merritt’s actions in acquiring her husband might not be totally due to traits she had inherited from her father, but possibly also from her mother. As I previously stated, literary fiction is not my normal choice of reading material. I prefer a book with a well-crafted plot and a satisfying resolution, a book that takes me somewhere I’ve never been and allows me to experience something I’m not likely to do myself. But Roberta and I have noticed that whenever we read a book classified as literary fiction, we end up discussing family situations and family dynamics from our youth. A Spool of Blue Thread was no exception. Roberta’s family took in “strays” when she was a child, as did my husband’s family, and my family had a member who was “farmed out” as a teenager. Obviously these books, whether we like them or not, are providing us with food for thought and topics for discussion. Maybe that’s the point of literary fiction – not to take you to some new place, but to take you back to an old place or time in your life and allow you to see it from a fresh perspective. Are you a fan of Anne Tyler? Do you have a favorite Anne Tyler book that you would recommend, one that would give me a better understanding as to why her books are so popular? Time to start the discussion of our next novel from The Bestseller Code 100 list, A Spool of Blue Thread by Anne Tyler. Summary: This novel follows the lives of Baltimore residents Red and Abby Whitshank and their four children. 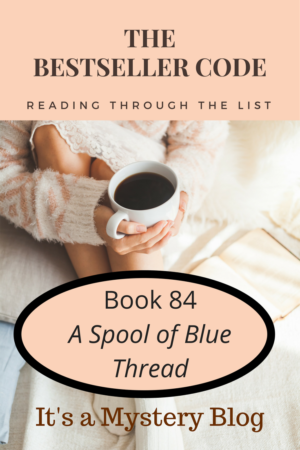 Have you read A Spool of Blue Thread by Anne Tyler? Have you written about A Spool of Blue Thread by Anne Tyler? Feel free to add a link to your review here. It’s time to start the next book in The Bestseller Code 100 challenge, A Spool of Blue Thread by Anne Tyler for Book Beginnings on Fridays. Summary: Anne Tyler’s novel follows the lives of a Baltimore family, Red and Abby Whitshank, and their four children. Someone recently told me that a novel should reveal who, what, when and where early in the first scene. Anne Tyler introduces who and when in the first sentence. What do you think? Would you read a book that didn’t introduce everything right away? Do you think different genres might have different rules, such as mysteries giving less away than historical fiction? Do you know any examples where the author waited past the first scene to reveal setting, time, or a main character? Did it work for you? Does this first line entice you to keep reading?